Sixshot skyrocketed like crazy after ROTF. I know many G1 prices inflated after the movie, but sixshot was literally going for double the $. I remember bc I was hunting one down myself. I think it's currently holding steady at about $80-100US loose complete despite being reissued as well as darkov from tfw2005 producing heaps of custom rifles for sixxy. Maybe $150-$200 for a MIB complete one? Sixshot's wings are actually slightly purple, they are not white. The one I saw had deep purple wings. I'd show you but the auction is gone now, probally ended. hmmm... you could be right. 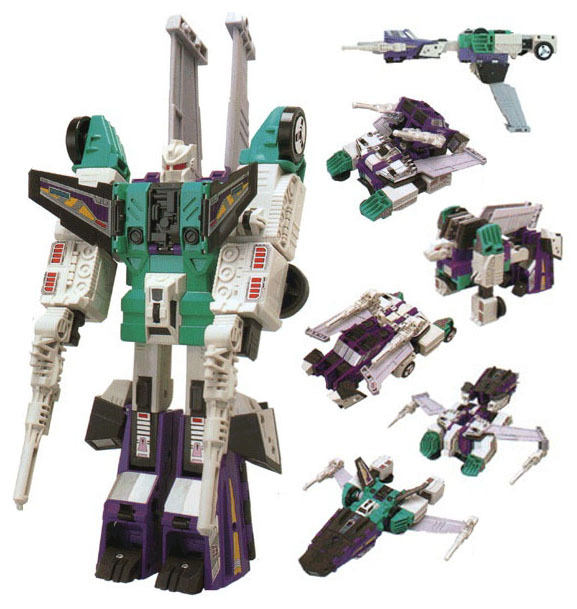 I did remember that Sixshot's wings are slightly purple (off whitish purple). I dont have a Sixshot on hand here to verify. Might have to wait for another member to confirm. So, my question is, how much should I be paying for either MIB or MISB Takara Transformer Collection Series ones (the re-issues that came in the book style packaging)? Fortunately, these are two of the cheaper TFC figures (relatively). I paid about $45 each when they were first released, but realistically, I think you might be looking at $65-70 for Hound and $70-75 for Blitzwing now, not inclusive of shipping. That's my hunch though, but I'm sure eBay would reveal the 'market price' for these. PS: I recommend getting all the TFCs if you are thinking of dabbling into G1. As I mentioned here, each TFC came with that little something extra that makes them all the more worthwhile. Thanks for the reply HD... it seems they all fetch over $140 (pre-shipping) for either one of them on eBay just from a quick search I did, so yeah, would be nice to find them around $75 each. As for collecting the entire series, while it might be nice to one day do so, at this stage of my collecting life, G1 doesn't interest me in the slightest - they were from my childhood and that's pretty much where they'll remain. Hound and Blitzwing have a certain nostalgic value to me, hence the need to want to re-visit my childhood (Hound being my first ever TF whilst Blitzwing being my first ever Decepticon). You shouldn't be paying anywhere near that much, VP. I paid less than half of that not too long ago for a MISB Detritus (the more scarce E-Hobby Hound Junkion that was released at the same time) and even less for a loose Overcharge (E-Hobby Diaclone Blitzwing). And if you keep looking you should definitely be able to get a complete Blitzwing of some sort shipped for less than $100 too. I think it was more a fluke than anything, but a year or so ago at a Perth Nexus, i picked up Hound and Tetsuwan Convoy picked up Blitzwing from the same seller for $40 each! So it's not impossible but.. unlikely. From what I've seen, I think HD is pretty spot on with his guestimations of the reissues. For some reason I don't see as many TFC hounds or blitzwings compared to the others. Vintage Hound I think has always maintained relatively high market value. Maybe bc he's a tad fragile? Never had one myself, but broken hounds are always sold in old G1 scrap lots that frequent ebay. It may be difficult to find an original one for the right price, but if you want something in minty condition then the TFC release may be the better alternative. Not much of a price difference (IMO) between the two. - TFC Blitzwing comes with his diaclone sword, which has a 'sharper' sword point and looks more like a sword than the original G1 release. - TFC Hound for completness reasons. Missing jerry cans and badly damaged sub-machine gun for Jeep mode are always issues with loose Hounds and such a pain to hunt down individually. - also, all TFCs comes with lots of added new art and tech sheets and mini posters within the 'book' cover itself. I know whoop is a vintage purist and might not agree, heh.